Why are sinkholes almost always round, instead of square-shaped, or triangular, or heart-shaped, or dodecahedron-shaped, or any one of the infinite number of other geometric forms they could take? The answer lies deep underground. USGS research geologist Dan Doctor joined us today to answer all our questions about the inner workings of sinkholes — including just what makes them take their distinctive shape. Ask A Geologist Whatever You Want About Sinkholes! When a void occurs in sediment that has a certain amount of cohesion ('stickiness' among sediment grains), the most stable configuration of the roof of the void is a dome, like the dome of the U.S. Capitol building. If that dome collapses, the vertical sides may remain upright, and the open hole will be circular. 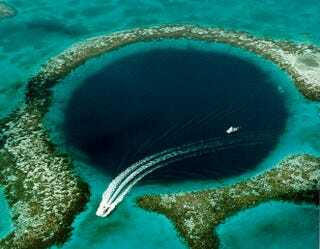 The sinkholes that form most suddenly are called 'cover-collapse' sinkholes. The collapse generally occurs in the sediments on top of the stronger soluble bedrock, but since the bedrock can dissolve in water, it may have solutional holes in it that allow the sediments to fall in, hidden from view. When the void in the sediment finally breaks the surface, the open hole might be smaller than the actual void below ground level. The reason the ground does not fall in right away is because the sediment has a certain amount of internal cohesion (stickiness) that allows it to hold together. If the sediment is not very cohesive, than indeed a large crater-like depression can result; these kinds of sinkholes generally form in more sandy sediments.